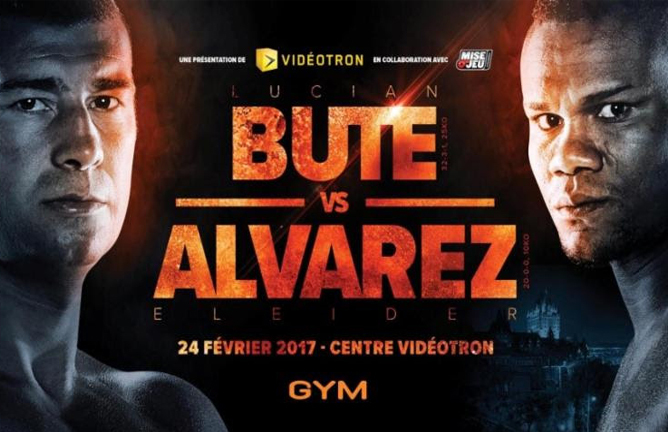 Former world super middleweight champion Lucian Bute plans to parlay his February 24th Canadian showdown with undefeated Eleider “Storm” Alvarez into his 14th world title fight later this year. The 36-year-old Bute (32-3-1, 25 KOs) is challenging Colombia-native Alvarez (21-0, 10 KOs) for his WBC Silver title belt in the 12-round main event headlining “BUTE VS. ALVAREZ” at Videotron Centre in Quebec City, Canada. Bute also hopes to become the first Romanian-born boxer to capture world titles in two different weight classes as the Bute-Alvarez winner in this final WBC eliminator will become the mandatory challenger for his GYM stablemate, reigning WBC and lineal light heavyweight champion Adonis “Superman” Stevenson (28-1-0, 23 KOs). Integrated Sports Media will distribute “BUTE VS. ALVAREZ” live in the United States, starting at 8 p.m. ET / 5 p.m. PT, on cable, satellite and internet pay-per-view via iN Demand, Vubiquity, DIRECTV, DISH and the FITE app for a suggested retail price of only $29.95. In Canada, “BUTE VS. ALVAREZ” will be available to watch, in English or French, on Canal Indigo, Shaw TV and Bell TV; English-only on Rodgers PPV, as well as in many of the top Canadian sports bars. Outside of North America, “BUTE VS ALVAREZ” is being distributed by leading boxing television rights distribution firm, Protocol Sports Marketing Ltd.
Bute was one of the world’s top pound-for-pound fighters for nearly five years (Oct. 19, 2007-May 26, 2012) as the International Boxing Federation (IBF) 168-pound division champion. The classy southpaw is 10-2-1 (8 KOs) in world title fights and he has defeated six world champions: Dingaan Thobela, Sakio Bika, Alejandro Berrio, William Joppy, Brian Magee and Glen Johnson during his outstanding 13-year pro boxing career. Now ranked No. 7 by the WBC, Bute is as hungry as he’s every been for one more world title shot opportunity. “I am fighting an undefeated Olympian who is the No. 1 ranked light heavyweight,” Bute said. “A win will conform that I deserve a 14th world championship fight. It means everything to me. I took this fight because it’s the shortest road for me to get a world title shot.